Base of Operations: Mobile much of her life, in the final days she lived on board the Carrier, the Authority's extra-dimensional base. Powers/Abilities: Jenny Sparks is a being made of electricity. As such, she can change between a physical form and a form composed of electricity. She can also tap into electric grids to enhance her power. In the past, Jenny Sparks has destroyed entire fleets by short-circuiting them. Known for her terrible temper, Jenny Sparks is not someone you want on your bad side. History: Jennifer Sparks was born on the first minute of January 1, 1900, one of a handful of "century babies" who came into the world that day. From an early age she was clearly an exceptional woman, and when she reached her twentieth year she stopped aging. Throughout her life she seemed to coincidentally encounter most of the people who would be significant to the forthcoming hundred years, such as when the teenage Jenny befriended an Austrian painter by the name of Adolf Hitler. In the 1920s England received a visitation from aliens who had taken over an alternate Earth, dubbed Sliding Albion. Jenny enlisted in the British Space Group and rose to the rank of Colonel, all in an effort to get closer to the action. She eventually visited Sliding Albion, where she married Lorenzo, an alien prince; the relationship did not end well. During the Second World War, Jenny worked as a spy; at one point she was captured, and would have been executed had it not been for Hitler remembering his one-time friend, and uncharacteristically granting her a stay of execution. In the early 1950s Jenny met the Lord Emp in his guise as Baxter, and soon after this, Sliding Albion, embroiled in an internal war, attempted to divert a chemical weapons into Jenny's reality, specifically right over England. The journey through the Bleed (the cardiovascular system of reality) somehow changed the gas so by the time it hit our England it was no longer lethal and actually acted as a localized comet affect on the unborn children of the country (e.g. granting several of them superpowers). Sliding Albion was for many decades believed to have wiped itself out in their war. 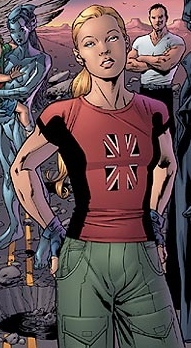 In the 1960s Jenny founded and led a team of British superheroes. Their tenure came to an end when they agreed to serve as security at an outdoor rock concert. Jenny's team-mate Adam Eternity, a supposedly indestructible man, attempted to stop some bikers from making unwilling subjects "expand their minds" by forcibly injecting drugs into them. This seemed to lead to a machismo contest, which concluded when Adam injected himself. Tripping out, Adam began to kill everyone in sight, leaving Jenny with no option by to kill him with a massive electrical blast. Needless to say, the team did not last long after this. By the 1980s the superpowered children created by Sliding Albion's chemical attack were all grown up and itching to put their powers to use. Not knowing where to start, a group of enterprising young superheroes located Jenny Sparks and convinced her to mentor and lead their new team. While investigating a string of serial kidnappings of infants Jenny stumbled upon a documented sighting of one of her teammates, Firesign, flying over the scene of one of the crimes. Fearing the worst Jenny snuck into Firesign's apartment and stumbled upon a very disturbing sight. Firesign's wife desperately wanted children but Firesign's generation of superheroes were sterilized by the gas that gave them their powers and the wife was deemed too unstable to adopt. Determined to have her own child the wife had Firesign utilize his and his friends' skills to kidnap small children of every ethnicity. Jenny walked in on the wife after she had completed her "perfect baby" which was made up of the sewn together pieces of most of the kidnapped children. Shocked to her core, Jenny dealt with the situation in a terminal manner. After the end of her 80s team Jenny went deep underground, cut most of her ties with the superhero community, and tried to stay soused 24/7 so she wouldn't have to think about what had happened. She only returned to super-heroism after Henry Bendix recruited her for Stormwatch Black. She worked with the covert team until Bendix' excesses were revealed, and he betrayed Stormwatch. Jenny forced him to flee the Skywatch satellite, and months later, tracked him down and slew him, paying him back for all the deaths he had caused. In 1999, with Jenny nearly a century old, Stormwatch was disbanded after several team members died when alien xenomorphs attacked Skywatch. 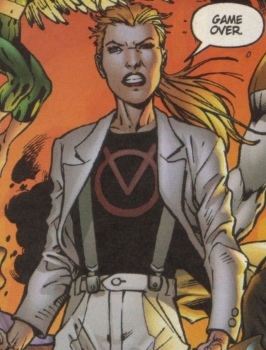 Jenny and the surviving members of Stormwatch Black recruited some new allies they had met during their time with the U.N. agency, and formed the Authority. Their first public mission saw them take down Kaizen Gamorra after he launched a superhuman blitzkrieg against several national capitals. Soon after this, it was revealed that Sliding Albion was still around, when they launched another attack on Jenny's reality, only to be driven off by Jenny's crew. Finally (for Jenny) the Authority confronted a gigantic and ancient alien being (dubbed the Owner of the Earth, or God) which might once have created life on Earth, and which was now returning to end it. Jenny gave her life to end this threat, exhausting her energies in one massive blast; she died exactly one hundred years after her birth, as the new century began. Down on Earth, a new century baby was born; Jenny Quantum, the Spirit of the Twenty-First Century. Thanks to "Cadmus" for additional information.